The Therapeutic Clown can be found in the Paediatric Medical Day Unit in the mornings. In the afternoon, the Clown is in the Paediatric Inpatient Unit and Children’s Emergency. As the saying goes, “laughter is the best medicine”. Humour and laughter can help create a positive and hopeful attitude. A good laugh relaxes tense muscles, sends more oxygen into the lungs and lowers blood pressure. Laughter is infectious and smiles are contagious, two good symptoms to have in a hospital! The Therapeutic Clown program helps improve children, youth and their families’ hospital experience with play and humour. Our program creates a safe place that supports emotional expression, empowerment, and social interaction. 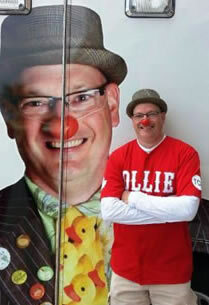 Ollie Pale is our therapeutic clown, equipped with magic tricks, toys, gags and a mischievous nature. He is a non-medical staff member who helps to normalize children’s lives during their hospital visits. He is spontaneous, witty, playful and takes pride in making people happy. Ollie is at Children’s Hospital four days a week: Monday, Tuesday, Thursday, and Friday. In the morning you will find him in the Paediatric Medical Day Unit. In the afternoon he can be found on the 7th floor paediatric in-patient wings. Throughout the day Ollie also visits Children’s Emergency, and upon request he will visit Paediatric Day Surgery and the Paediatric Critical Care Unit. Ollie provides individual and small group activities in patient rooms, playrooms, and hallways. Patients will experience a playful, fun-filled distraction from the medical side of their day. The patient decides whether or not the clown may enter his/her room to play and how they would like to interact with him. The Canadian Association of Therapeutic Clowns is the professional association for therapeutic clowns in Canada.